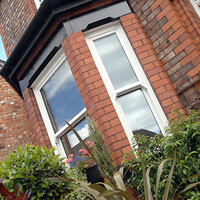 The windows you choose have a major influence on the look and character of your home. Our bespoke products are available in a range of designs, styles and colours. Choose a finish that makes your home unique. Relax in a home that’s warmer and quieter too. Our insulated frames, quality double glazing, weather tight seals and multi-chambered profiles ensure that heat loss is kept to a minimum. Where noise is an issue, the thermal insulation properties of PVCu and our Q-lon gaskets will help to minimise any disturbance from the world outside. Our range of bespoke casement windows are available in a wide range of styles and colours, meaning we can offer you a design of window which best suits your home. 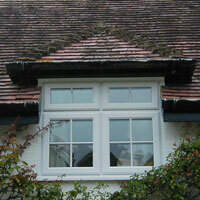 White PVCu with external georgian bar, ideal on period properties to retain period features. With rising fuel and living costs, it makes sense to let technology help reduce the heating you need - and cut carbon emissions too. If the windows in your home consist of single or older double glazed units, replacing them with energy efficient windows will save you money: in fact it can reduce the energy you need to heat your home by up to 20%. There are a range of design and style options available, allowing our customers to create a bespoke window style to best compliment their home. 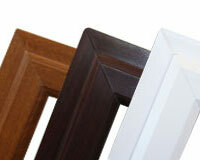 Our range of quality PVCu products are available in White, Rosewood, Cherrywood, or a combination of Rosewood/White. 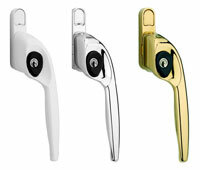 Available in white, chrome or brass, our handles can help create a traditional, classic or modern style of window. Choose from our wide range of decorative glass, including stained, bevelled and etched glass designs, to add a unique and personal touch of style to your home. 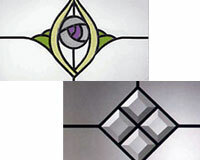 Choose form our range of obscure privacy glass. 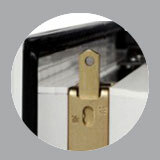 Our quality PVCu windows feature a multi-point security locking system, combining rollers, shootbolts and a deadbolt, to protect your home from unwanted intruders, giving you extra peace of mind. Steel shootbolts and mushroom cams fitted top and bottom ensure the highest level of protection and security performance. 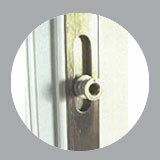 Steel anti-separation mushroom bolts protect and seal the window through high levels of compression. 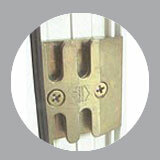 Metal striker plates for mushroom bolts provide maximum protection against forced entry. 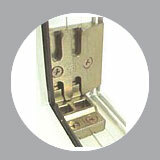 Metal shootbolt and mushroom striker plate combination gives optimum security to vulnerable corners. Our vertical sliding sash window range combines the elegance of traditional sash windows with the benefit of modern materials. Manufactured from PVCu they are strong, will not rot, warp or require repainting, ensuring that they retain their colour and shape throughout the years with the minimum of maintenance. 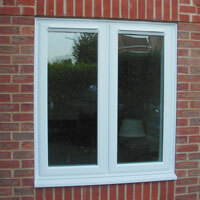 The tilt and turn window, is a highly attractive modern style PVCu window. They are made to open from either the side or top. 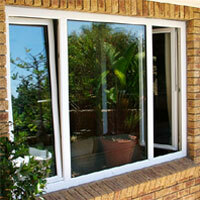 They tilt inwards in order to provide secure ventilation, whilst also opening fully for easy cleaning.